It is becoming increasingly more and more rare that I get excited about a product review, but this morning is one of those times! To open a box and find a truly organic, truly sustainable product is a delight! Live Good has made my morning delightful with their organic baby pillow. We were sent the Elephant Pillow because I love elephants! This dandy little elephant is alert to playful possibilities. Part of our Endangered Species Pillow Line, he represents the African and Asian elephants now facing extinction. The image is screened onto organic white cotton sateen using water-based ink, and the back closure features soft fabric ties to fascinate little fingers. Pillow measures 14 by 14 inches. This pillow comes with an organic insert stuffed with fibers from the kapok tree. These inserts are moisture-resistant, quick-drying, lightweight, completely hypo-allergenic, mold resistant and odorless. All Live Good products are hand-crafted in California using 100% certified organic materials sourced in the United States. That is a long time to be lying in and exposed to chemical flame retardants and synthetic materials. I feel it should be a priority for families to provide the safest, natural space for this rest. Thank goodness there are companies like Live Good! So we’ve started a business that reflects this ethos: a Live Good line of home products that upholds each and every aspect of our mission. Everything we make is local. Everything is sustainably sourced and organic. And everything is designed to increase your quality of life. We haven’t sacrificed luxury and beauty in our commitment to supporting practices that are ecologically and economically sound. 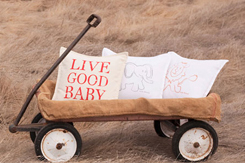 Live Good is awesome, and the bedding is perfect for your nursery furniture! Baby pillows? I was children aged under two years should not have them. They are more for decoration.